The mind is a weird place. I mean, you should know, since you're the psychic forces swirling around in there! Your human thinks about such strange things all the livelong day. It's when they fall asleep, though, that you really get to have some fun. Dreams are AMAZING! Sadly, humans forget your masterpieces so quickly...but not tonight! Tonight, you're going to help your human have the most intense dream and then help them remember every last piece of it. 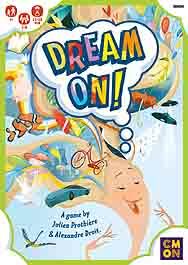 Dream On is a cooperative card game for 2-8 players, ages 7 and up. Weave a weird, wacky, and winding dream together with your fellow Dreamers before trying to remember everything you experienced, good and bad. The higher you score, the better you'll feel in the morning!